Get ready to see the action the likes you never knew were possible in Bonanza! Bonanza is not like many of the slots you’ve experienced before. In total there are over 117649 pay-lines in this slot, which doesn't sound physically possible, yet here we are telling you. 6 reels await curious players who have yet to marvel at a slot so unique before. Bonanza is one of the funnest experiences we’ve ever played, and we’re sure that other players who are coming into this slot for the first time will no doubt feel the same way. Players who are looking at long term goals, then there is a 50 coin jackpot available for players to try to find on these reels. We should also mention at this point that the RTP percentage in this slot is a very positive 96% which should be enough for the players out there looking for the most returns on slot investment. Click here to discover more. Bonanza is a slot that takes place at what looks like a mountain, where mining is at the forefront of the jobs around here. 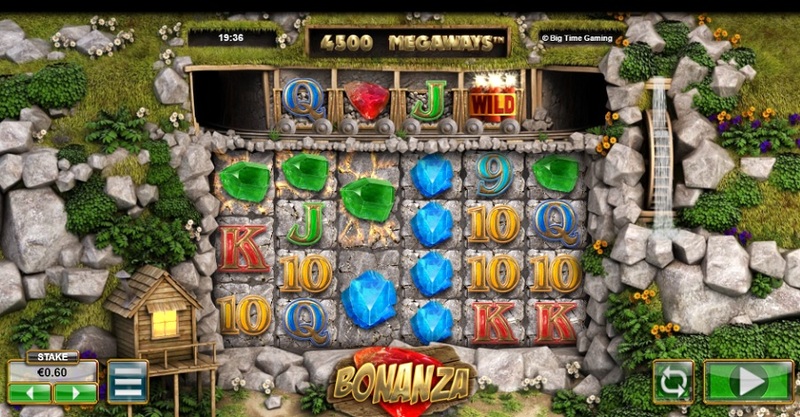 There are actually quite a lot of mining themed slots online out there, which is something we did not really know until we played this slot and saw the amount of slots were recommended after we played Bonanza. 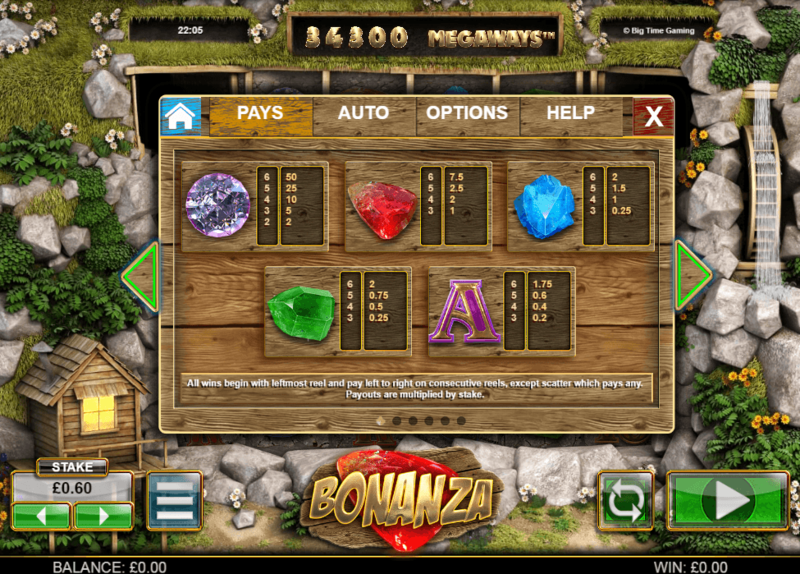 Bonanza is not like any other mining-themed slot you’ve come to know. This is a 3D slot from developer Big Time Gaming, and it offers all of the most up-to-date features that you’ve come to expect from a reputable developer the likes of Bonanza. Be sure to check out the rest of our review in order to find our more about Bonanza! This is a very difficult question for us, as this slot isn’t really like any other that we’ve experienced. Bonanza is not like most slots, it moves to its own sound which is what a lot of slots should be doing nowadays. We are so tired of the same outdated formulas, why cant every slot be like Bonanza? Where the developer tries something completely different, all to the benefit of the player, as well as the developer who gets to see their hard work play off. If you have never played a slot like this before, and you only ever play slots that are so similar to one another, then you will no doubt find that this slot opens doors to a wide variety of other slots that try to reinvent the wheel. The action on these reels move fast and wild which is perfect for a slot with the name Bonanza. The graphics here are incredibly crisp, and serve to keep players immersed into a slot that will no doubt be around for many years to come. In-fact, Bonanza is one of the most popular slots going today, and is often featured on various other casino based sites, as one of the must plays, and once you see more from this slot for yourself, you will do nothing but agree. This slot is a very beautiful one, in the distance one can see nothing but clear green banks, as well as a random house that sits at the bottom of the mine. The lights are on so someone is obviously home and is waiting for you to win big before he moves out. Each and every symbol on these reels offer something different in terms of numerical value, with symbols being matched in the classic left to right orientation. Symbols here are a mixture of low and high value symbols. Some of these high value symbols are bonus symbols, but we shall get to those in a minute. The symbols are a mixture of various diamonds and jewels. All of these jewels are of a variety of different colours, making them incredibly easy to match. Players also have a chance to spell out the word: gold with some of the symbols on the reels, which offers an additional feature in turn. Players who wish to spin these reels without actively being on the screen, will find that the autoplay feature is where it’s at. Autoplay can be stopped and started at any given moment, all one needs to do is set the amount of games and bets and watch as to what happens next. There are a tonne of additional features on these reels for players to use in order to get their scores in the highest possible combinations possible. If you are yet to experience an online slot before then some of these features might come across as quite complicated, but with more spins comes a more comfortable/relaxed state. DYNAMITE WILDS: Sticks of dynamite are this slots chosen wild symbol, matching this symbol will substitute out for various other symbols on the reels, specifically the scatters. CART BONUS: During standard play, one will randomly see carts above the screen adding additional symbols into the reels once one matches symbols. This is a great way of getting repeated wins. SCATTER: The various gold letter symbols are this slots chosen scatter symbol. One will simply need to spell out the world gold in order to win free spins accordingly. Bonanza should be at the top of everyones favourite 5 slot list. We personally have it at number 1, where is it on your list? If you are yet to experience this slot, then be sure to check it out at your earliest convenience. You may also enjoy playing Jungle Jim El Dorado!